This world would have no set time or place so I guess we could all vote on it setting. Though I suggest before the timeline of the actual anime. Cause well *spoiler* be warned I have not spelled check this yet cause i grew lazy. In this world life is normal to many. From times that are happy to times of great misfortune. Those live in ignorant bliss never questioning how they get to where the human race is or how the world has been shaped. But in all fact the world has been shaped by a force of Entropy and Incubators. You have suffered great misfortune. With a wish so great you find yourself approached by a strange creature. It introduces itself as Kyuubey. It offers to grant your wish if you become a Puella/Puer magi. Explaining in exchange you would have to defeat malicious creatures called witches in exchange for the power being a magi would be. But if you agree you will get any wish you wanted granted. You accept and soon a strange ritual is preformed by the creature it is painful as he reaches in and the sensation feels as though your very soul if being torn from your body. A small jewel is placed in your reached. The creature calls it a soul gem and soon you feel the power coursing through you. Soon you learn of witches and there familiars. 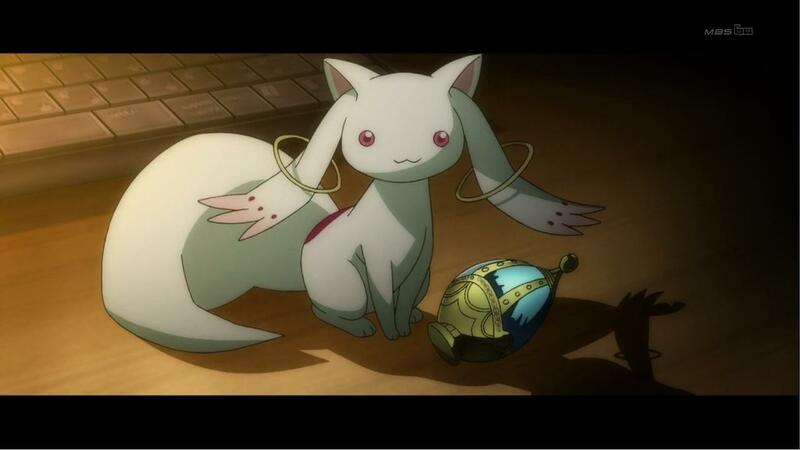 How you learn you can unlock your magic and become a puella. From your transformation to summoning your weapon and magic. You learn the dark nature of witches how there kiss brings misery and suffering to the world...the cause of murders...suicides and accidents. You vow to destroy them to protect people and in exchange for each battle you win. You get rewarded the witches Grief seed. If left alone...the witch will re spawn but if used by you...it will give you more power and cleanse your soul gem. In your time as a Puella/Puer you have witness others who selfish need for power makes them put innocent humans at risk to make more witches and therefore grief seeds. You see those who fall in battle bodies lost to the strange realm of the witch. The worse you find is the secret of the soul gem. Your body now just a doll that fall lifeless if the gem is to far away. You watch as your gem becomes dirty as your sorrow taints it. From now longer being human but some puppet for Kyuubey. the soul gem is the fourm the soul takes after the contract is made. It generally takes the egg like fourm but will have some minor charactistis that are individual to the magi. Like at the top decoration will be a shape that reflects the magis power or wish. In its hidden fourm of the ring many magi also have this marking on there left ring fingernail. Please note not all magi have this. When the magi has transformed the gem will be attached to the body or outfit in some way or fourm in the same shape as the top decoration. The soul gem can also become a grief seed when the magi uses all of there magic or has lost hope in there wish or regrets they generally end up in the path of despair and become witches. Witches are the creatures that spread despair and misfortune around. Born from magi when there tainted soul gems turn into greif seeds. Magi go out of there way to destroy them. Using the Soul gem as a way of drowsing them. Witches often hide themselves behind barriors. To keep hidden from magi in there own realms while they grow and become more powerful. Magi can hunt these out and enter them. Regular humans also can stumble upon them. Those drawn by a witches kiss or there own despair also tend to stumble into them. Witches have a tendancy to hide themselves in areas where there more likely to find victims eg. Hospitals, roads with high accident rates, bridges, tall buildings and rail way tracks. Inside the barriars tend to be a strange maze indiviual to the witches often reflecting on what caused them to become a witch. The witch also has many familliars in the barrior to help guard the witch. Some witches are so powerful they do not require barriors. Kyuubey to be npc'ed but he should play a minor role in this if any at all other then to make contracts for characters who do not start as magi and wish to be one later. I also think no one should do a Madoka and copy her wish. Make wishes sensible to entropy. The entropy reflects the amount of suffering a magi is to suffer. Eg Madoka was only so powerful due to Homura repeats and tieing the fate lines. At the original fate line she was a average magi due to her life being rather normal. Her poteinal baffled Kyuubey till he figured out Homura's power. weapons: you may have one type of weapon. (unless your Homura) They generally have two catorigies. Stationary and Scattering. Stationary would be a mele weapon. Eg Sword or spear. Power: Some magic is generic. Eg regeneration to speed. But each magi has there own blend of magic that is realtive to the wish(in most cases) Eg Homura wished to go back and redo her meeting with madoka and protect her. So her specialized magic was the ability to bend time as long as there was sand in her shield. Some magic is a specilised version of the generic. Eg Syaka wished to heal her crush. She therefore had better regeneration to the point she could block pain and become a berserk-er. I suggest maybe we have a range of magic. So there is general magic eg healing speed and barriors. But everyone has a specilized magic. Example being Matthew can become invisible to witches for a short period of time (if say he wished he was noticed more) Where Lukas could have a guardian spirit during battle which would take some damage and deal it back. (if Lukas wished for the power to protect Ice from an abuser) It dosn't always have to reflect the wish but it seems to be the general theme. Keep in mind of the time line. It's possible we could have a Homura like character who can make new time lines on a joint agreement with the forum. So eg if your magi becomes a witch you don't have to call it end game. Either you play on as a witch. Or we bring in someone who could make new timelines and have parrell universes. It would require players to have to keep track of there timelines so example. Lukas is in four timelines. In timeline A he has witnessed Mathias become a witch and has learnt the dark secret of the soul gem. He proceeds to warn Arthur. In timeline B Mathias hasn't become a witch therefore he dose not know magi become witches and therefore never informs Arthur. In timeline C He witnesses Mathias become a witch and in despair he becomes a witch in front of Arthur therefore Arthur learns the secret. In timeline D he witnesses Mathias become a witch but chooses not to inform Arthur about the soul gems. In those 4 timelines only in A C and D would Lukas have the information about soul gems. in Timeline A and C would he somehow pass that onto Arthur to know. So we would have to keep on top of people not mixing up timeline knowledge. I'd say when a location is agreed ed Tokyo, London, New York. we use maybe major landmarks for some boards. A school is a must. Then make sure people put the timeline (if we do them) in the description so people know what one. I think i covered enough. Any questions leave a comment below and I will do my best to answer them. I wasn't sure if we wanted the canon location which i think is tokyo. Or somewhere general like we do with some of the other au's. Maybe new york? ...I kinder want to vote Cardiff or london for a british twist. Oh wow!! How did I not see this before?! shall i add a setting poll? Yeah Time lines is not essential but i taught it would be interesting to see people take there characters down different paths. maybe if we keep it to 3 timelines at the start? and the person who controls the time shift is a trusted rper? maybe one of you two? Maybe having it that its got to be a majority decision if we do a reset the clock new timeline. *nods* Agreeing with Kiku here on the timelines bit, but perhaps in the meantime you could help us by making a list of prospective settings as a post in this thread? That'll give us an idea of which locations we've got to choose from, and we can add to it if needed by the time we're ready to put the poll up. Perhaps we should wait until it's closer to the time to add the AU though? We should see what people think of the AU idea first before we get into setting (I'm sure everyone will love the idea, but we should run it by the forum as a whole anyway).